Folk artists in Mexico are a shining example of what being crafty is all about. They can't simply run to Michaels or Jo-Ann Fabrics for a hunk of fuchsia clay. Instead, our south-of-the-border friends make the most of their resources. The results are shiny, happy, thrifty, and wickedly clever. From painted tequila bottles to glittered cigarette boxes to wood frames trimmed in bottle caps, the materials and concoctions are endless. I channeled that infectious spirit for this project, and used only what I had on my art table to accessorize a bland flowerpot. Toothpicks and head pins are great for making microdots, and small paint bottles as templates for shapes. The secret to this look is to cram in as many contrasting primary colors as possible. Step 1: Prepare the pot for painting. 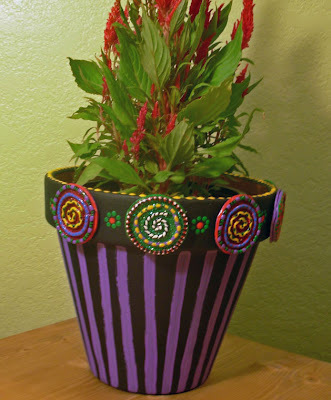 Base-coat your pot with a paint color of your choice, then varnish it and let dry. Set aside. Step 2: Make a template. Use the bottom of the paint bottle to draw a silver- dollar-sized circle template on the cardstock. Cut out the template. Step 3: Make the circles. Working on a clean, flat area, pinch off a hunk of clay, flatten it, and use the template to cut out a circle. Pinch off another piece of clay and roll it into a long skinny snake, about the size of a spaghetti noodle. Arrange it around the clay circle to look like a border, and cut excess with the craft knife. Add a swirly design of choice in the center and cut off excess. Make 10-12 more. Step 4: Bake the clay. Bake in oven according to package directions — usually about 15 minutes at 175 degrees. Remove and let cool. Step 5: Paint the circles. Base-coat the circles, then let dry. Add contrasting colors to the top ridges, let dry. Use the head pin to add dots and squiggles, let dry. Add a coat of brush-on varnish, let dry. Step 6: Attach the circles. Hot glue the circles around the rim of the pot. Add more painted designs if desired, and a coat of high gloss varnish for that extra punch. Variation: Add glitter to your circles, or make them in squares or other shapes. Use the clay to spell out words or other designs. Alternate the sizes of the circles for a crazier effect. If you absolutely must, use rubber or foam stamps on clay circles instead of swirlies. P.S. Check out my new novel!